Carte Itinéraire et Politique d'Europe d'après les derniers traités de paix, Avec les plans des principales villes d'Europe. 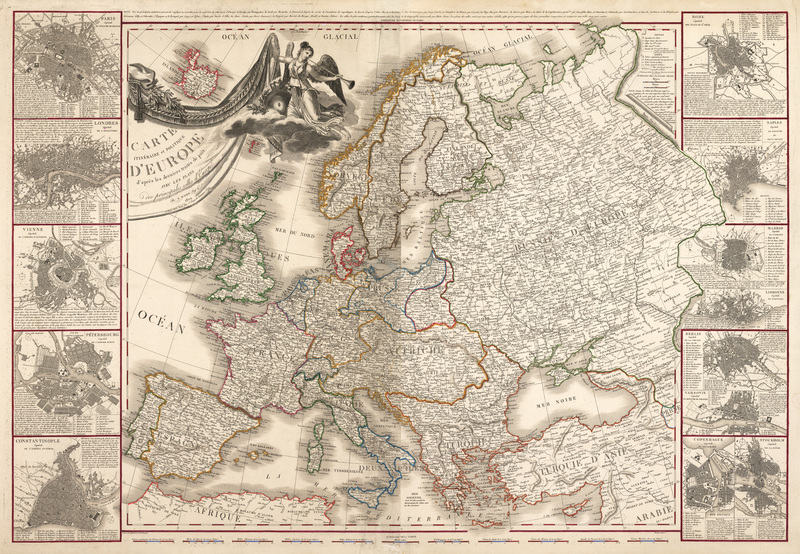 This amazing map of Europe was done during and shortly after the major European reshufflings of borders which took place in the first quarter of the 19th century. The engaging map stretches the entire width and breadth of Europe, from the British Isles to the Ural Mountains of Russia, and from the Arctic Circle as far south as northern Africa and northern Arabia. Maire’s map is highly detailed including major cities and smaller towns and villages, mountain ranges, lakes, rivers, seas and the northeastern edge of the Atlantic. Around the map central Maire has included highly detailed urban maps of thirteen of Europe’s major cities, including Paris, London, Vienna, St. Petersburg, Constantinople, Rome, Naples, Madrid, Lisbon, Berlin, Warsaw, Copenhagen and Stockholm. These maps include the centers and outlying districts of each city, and the major rivers, ports or other bodies of water on or beside which each city was founded. Each city map is accompanied by text in French providing details of the salient features of the cities. Important edifices are named and population figures are even provided. Iceland is included in the center of the Baroque title cartouche which embellishes the map. This grand map is encyclopedic in the information it provides, and is in fact fourteen maps in one. It would be a splendid centerpiece for any room. Little is known about engineer/geographer Nicolas Maire, but his maps testify to the important contacts he had in the government of Paris at the time he was working. In 1808 he published a small city atlas of Paris containing twenty pages and 104 pages of alphabetical listings of streets and the addresses of public offices, hotels, hospitals and other establishments of interest. Condition: This hand colored map is in A condition, a strong impression on heavy paper.